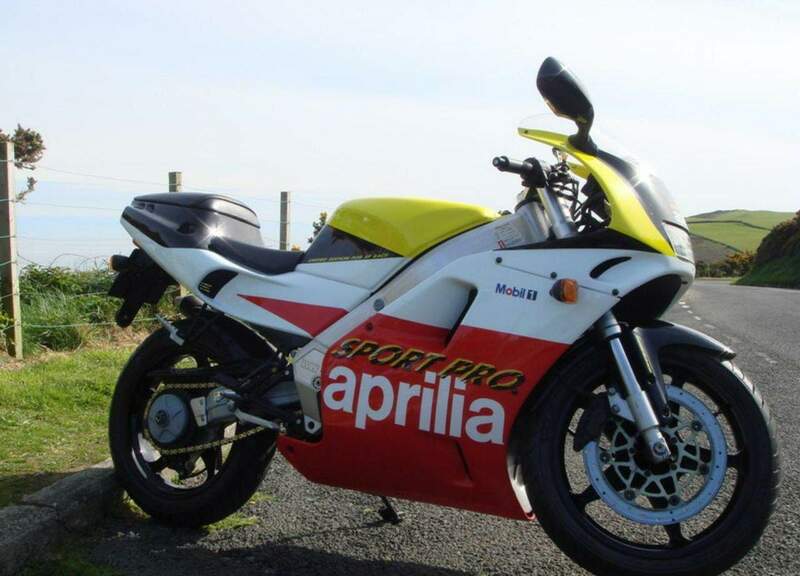 The full-blooded version of the APRILIA AF1 SPORT PRO prove all that size has nothing to do with it. Put it this way, the Sport production has an electric start but I bumped it off. So much more racy. How else could it be on a bike that, to Kevin Cortina at least, looks more like a GP racer than most GP racers? Or weighs 2501b (light but not too light), or makes the other handling-gymnasts to hand (ZXR400, KR-1S) feel as agile as aircraft-carriers? Who can blame you for insisting on being called Loris or Bruno and for crying a lot? 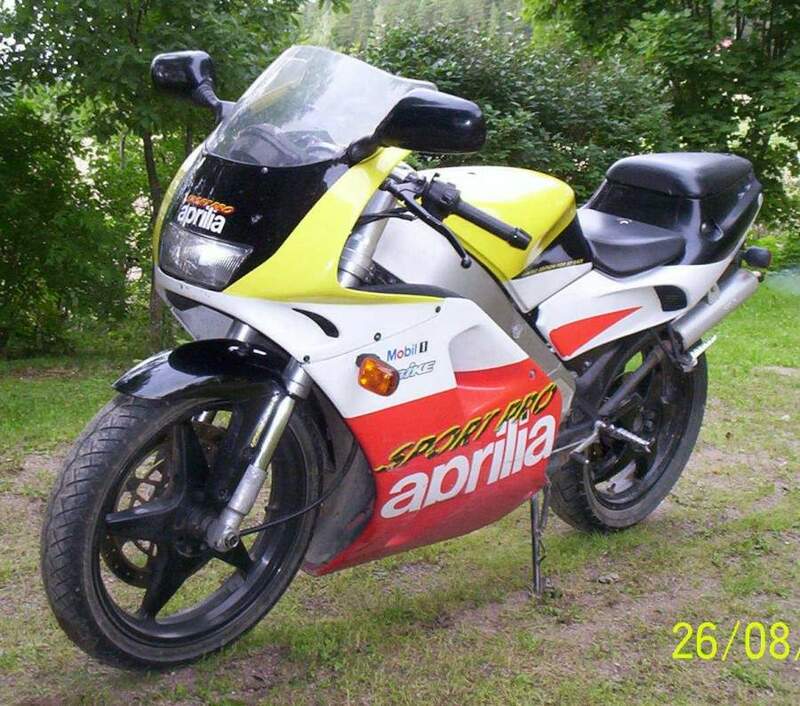 This is normal Aprilia behaviour, completely over the top. In Italy the Sport Pro is flagship to the Replica, Futura and unfaired Europa 125s in a market fickle even by that country's standards. Mono-arms, upside-down forks and crispy-crackly replica spannies mean everything to stroker aces there; you can't patronise them with duff clobber. Discs must be floating, calipers must be multi opposed-piston, frames must girder-like ally beam affairs. Aprilia 125s have it all and the Pro has a bit more besides: wider rear rubber — a 140-section Sportmax radial no less, a close(r) ratio six-speed box, and a redesigned tailpiece with a larger pillion perch. It succeeds the Futura in the UK at last year's Futura price. This one is unrestricted, which is important. On a strangled 12 horse Suzuki RG, 125 riding is all a bit of a perverse giggle. Tiny, cramped riding position, naff-all power; what else can you do but play silly buggers? The hard-earned buzz comes from eeking out the last few mph and from beating traffic with slipst-reaming and last gasp brakes... Good but odds-shortcning fun. A 33bhp 125 .is different. The same rules apply as regards momentum riding and screaming it silly. But they apply at another level - up at 95, l00 mph and deep into the territory of landmark 250s like the lock-up-yer-daughters 35 bhp 250LC. On the Pro you plant your chin on the tank for the hell of it and because you want to, not because legislation demands it. I did it because playing at Dusky Genius, 125 star, beats playing at World Superbikcs any day. In conflict with this tiddler-racer image is the Pro's classlessness - its capacity defying size and feel (and expense). A clever riding position accommodates six-footers as well as it docs midgets; dropped bars and raised pegs somehow manage to be generously roomy and wide (the bowed mono-arm splays the pegs). The seat's been designed and the bum-rest is yards back. It makes you sit knock-kneed (the tank is narrow) but sporty-relaxed with room to manoeuvre. There's a big view too: white faced Vegila tach', a speedo which looks like it shouldn't be there, and efficient Honda-esque switchgear. It feels like a 200cc KR-1S and initially disappoints because it doesn't go like one. The carburation hasn't the accomplished sophistication of an RG or TZR125 let alone a free-revving 250 twin. Nor is it helped by a twistgrip that's slow to close — not always where you think it is. Power is unstable on a cracked throttle and hunts on a closed one. If the throttle's going in the right direction, RAVE assisted delivery is useful beyond 5000, crisp at 6500, and then zaps from 8500 up to 10,500. It's hard to describe really; yes, the Pro's quick like no other 125 I've ridden but, no, despite its 33bhp at 11 000 rpm that addictive stroker drug — that Snap — is missing. ■ The KR-1S is only 331b heavier yet packs nearly double the horsepower, and that has Snap. 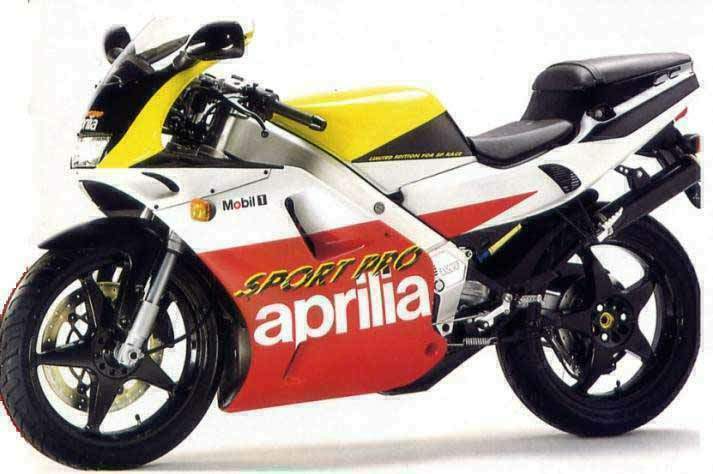 The Pro's not even as exciting as was the similarly-powered 250LC, and that had 50 lb of extra flab. Reality is that a modern 125, especially one with RAVE exhaust valves to smooth and sanitise any peaky rough edges, delivers not in rushes but from immaculate riding and gearboxes. The Pro's six-speeder has three tall bottom ratios (7000rpm to launch in first), three close top'ones (it won't rev-out in useful top) and a shift as quick and light as any. And I've just remembered that the LC was exciting because its chassis was barely fit for 20bhp. The Pro's wouldn't notice 50. Yup, remove those rose-tinted specs, establish that it isjust a 125 and it's furious fun. The first three gears need the light but late cable clutch to ease the transmission's angst, then it's left foot only as the ripping spannie turns on the adrenalin taps. The tacho kisses 11,000, back down to 9000ish (top of the torque curve), back up at 11 before you can blink, the 'box wasting not a drop. 150kph comes easily, the tank tingles, then the pegs and finally the bars as power tails off at the redline. The effective fairing wobbles around alarmingly taking the clocks and mirrors with it. You're tucked in, you're laughing; you brake, you pull up 10 yards before corner. Blimey. Damn, forgot it was a 125 again. Easily done because the Pro's straightline stability is another capacity defier- real big-bike stuff which I accepted gratefully. When you engage cornering mode, braking, steering and body language have to switch back to speed-preserving 125cc head-banger tactics. The Pro actually steers slower, less from the front wheel than, say, the RG. It also holds its line over bumps which get lighter or more cheaply suspended bikes twitching. But it's still a 125 — rapid, responsive and phenomenal on the brakes. The suspension is non-adjustable and it works. For my stone it was soft enough to absorb almost everything, controlled enough to keep it taut. The front brake gives a hard, aftermarket-braided-hose feel via a wide-span lever which makes rationed sweeps of the disc - what it needs - tricky to seperate from nut-crushing stoppies. Once sorted I knifed through turns with more precision than ever before. Fast in, fast out. Usually. Surprisingly, the limit is the Sportmax radials. Despite the rear's nominally wide size it's fitted to a narrow rim and doesn't seem to work as it should. It feels skinny, precise too, but grip tails off disappointingly early. In the wet they were faultless and, hey, a 140 on 125 - who cares about grip! Doubts surround its fragility and the top-end's ability to sustain 10,000rpm plus action for thousands of miles. But what's the price of a piston and rings compared to a tappets-job on a ZXR? About the same probably. It's about time bikes like this got a break; the Sport Pro is classless, as good and as much fun as most 750s and beats the insurance vultures too. Recommended to speed junkies with sick licenses.